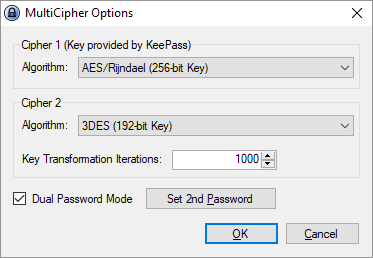 This is a dual cipher model with independent keys that uses two ciphers to encrypt the KeePass database doubling the data length with random pad. It follows a method as mentioned by Bruce Schneier in his book "Applied Cryptography". This is a major rework of the original version 1.x of the plugin, it is recommended that older version is no longer used as this version attempts to make sure that the memory is cleared of any sensitive information and provides more choices of encryption algorithm. There is no block padding and is filled with random bytes where the true length is indicated in the header, also AES key and IV is provided by keepass and only 3DES Keys and IV are generated. AES Keys are provided by Keepass (Entry made during master password entry screen) and IV. 3DES Keys are generated by combining the keys derived from the second password entered along with SHA256 of (Plaintext XORred with m bytes + b1 bytes). It's a very nice plugin, for the paranoid :). The only complaint I have is that it is not universally compatible with any keepass port (Unless integrated by 3rd party developer, which isn't just yet). Hope to see stability updates/security improvements if necessary in the future :) Maybe make more algorithms availible, or seperate plugins with better algorithms such as TwoFish/ThreeFish, Serpent etc... 3Des doesn't seem as secure as other's, just an idea.